As much as I say that I love me some Akira Kurosawa, there are far too many of his masterpieces that I have not seen. His retelling of Macbeth, THRONE OF BLOOD, is one such movie. We’re switching cable companies and losing our current DVR next week, so this is a perfect excuse to get at some titles I have been putting off for too long. I watched KUMONOSU-JO (THRONE OF BLOOD) (1957) on 2.26.14. It was my first viewing of the film. When samurai would draw swords and due,l their battle often would take time. They would measure each other, each awaiting the movement of the other. A strike may happen. Then more circling, more stillness. The battle would go on this way; sometimes short, sometimes long. Extended stretches of quiet followed by fierce action. Akira Kurosawa directs THRONE OF BLOOD in this same manner. We are privy to long periods of inactivity, of horses galloping, of soldiers marching, or of men walking. When action hits it is often swift and brutal, only to return to more stillness. There are a couple of moments of surprising violence in THRONE OF BLOOD. Not by today’s standards, of course, but one execution and another death by arrow come with surprising ferocity. 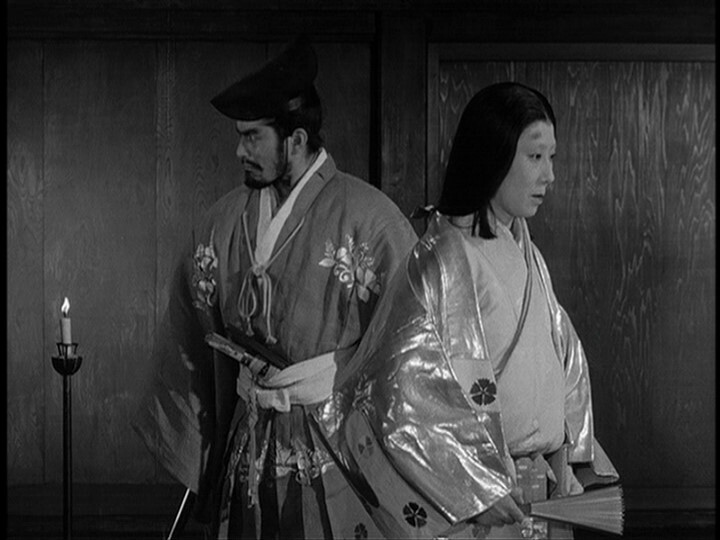 THRONE OF BLOOD cashes in on the known elements of William Shakespeare’s Macbeth. Ghosts and demons are introduced freely because we know the story of Macbeth. They need not be explained or justified. Instead, this feudal Japanese world is merely a world in which these entities exist. Kurosawa is not married to a Japanese translation of Shakespeare’s text, instead using the source material for its plot and themes. The film tells of Washizu (the great Toshiro Mifune) and his good friend Miki (Akira Kubo). A spirit, a stand in for Sheakespeare’s witches, tells them that their recent glory in war will see them gain status and be given new positions. After that, Washizu will see the throne. He will be succeeded by Miki’s son (Minoru Chiaki). When the first half of this comes to pass, Washizu is thrilled. He is satisfied knowing one day, if the prophecy holds, he will rule the land. His wife, Asaji (Isuzu Yamada), on the other hand, thinks him foolish. She convinces him that Miki, wanting his son on the throne, will be in the ear of the current Emperor. She tries to convince Washizu to act immediately and aggressively. This version of Macbeth cuts out the side plots, for the most part. We do not see much from the perspective of those other than Washizu. It makes for an efficient telling. Mifune is, as might be predicted, exceptionally strong in this role. He begins humble and grows more and more enraged and uncontrollable. As powerful as he is, though, Yamada is even better in the Lady Macbeth/Asaji role. Her stillness is absolutely haunting. She gets everything she wants through gentle prodding and insistence. The sound of her kimono dragging along the ground, backed by silence, as she moves into another room to get the poison is horrifying, even if it is hard to pinpoint why. When we hear that sound again a few moments later, we know it means doom for somebody. She is pure evil. When this story’s version of the “out, out, damn spot” scene comes, it does not feel like enough punishment for her. I’ve never seen an actress do so much so simply. It is a stunning performance, one of the best female performances captured on film. Kurosawa does so much with stillness and patience. There is certainly a reliance on the fact that the viewer has a cliff notes knowledge of Macbeth in the ability to create tension anticipating what is about to come. Perhaps it would feel a little slowly paced to those who are not aware of the next beat, it is hard to say. But there is nothing boring in the stillness, only tension. The consistently open and empty spaces speak to the darkness within Washizu as he tumbles down a fated path he is powerless to stop. Wonderful filmic choices are stuffed throughout this movie. I need to revisit SEVEN SAMURAI again. And there are a bunch of Kurosawa’s major films to get to. 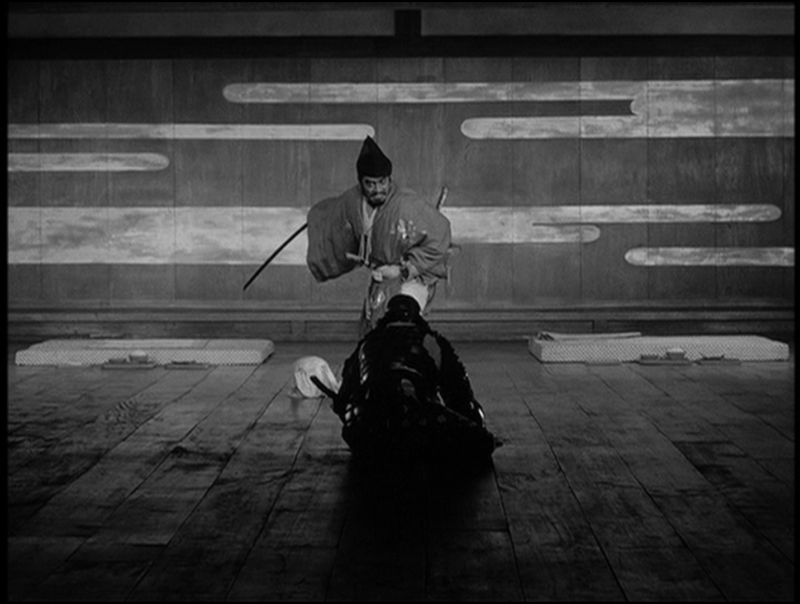 But, as of this moment, THRONE OF BLOOD is at the top of my list. The black and white cinematography is stunning. The ghosts are haunting, the stark rooms forboding, and the foggy exteriors absolutely set and hold the mood. ~ by johnlink00 on February 27, 2014. I haven’t seen this one, but I do love Kurosawa, so I will. Thanks. Absolutely worth hunting down.